One Stroke Painting online shop and information about the hobby and craft of donna dewberry one stroke painting in the UK. 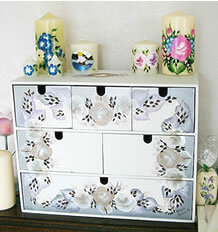 It's the perfect hobby and craft for those interested in decorative painting. Includes details of onestroke, one stroke painting classes, one stroke painting techniques and one-stroke tutorials. Visit our donna dewberry uk onestroke online shop selling crafts, folk art one stroke decorative painting and craft materials, books, folkart paints, folkart brushes, Donna Dewberry videos by mail order. UK craft and onestroke mail order supplier - for hobby and decorative painting crafts. one-stroke the perfect tole painting techniques for creative and deorative painting craft and hobby. It has to be onestrokepainting uk by osci, olga edwards, uk. Welcome to One Stroke Painting UK the easy to learn decorative painting technique developed by Donna Dewberry. This is Olga Edwards OSCI's web site dedicated to one stroke painting in the UK. Information about Olga and how she became fascinated with this wonderful creative painting technique. Information about one stroke painting classes and demonstrations. Online tutorials and Step by Step projects showing you the basic one stroke painting techniques. A portfolio of Olga's work which clearly shows just how versatile one stroke painting really is. One Stroke Shop Buy all your One Stroke / Folk Art paints, brushes, books, videos, teaching guides, etc online or by mail order. Thank you for visiting one stroke painting UK.